It’s a story of intrigue, corruption and multiple murders, stretching from the streets of Malaysia’s capital Kuala Lumpur, to Switzerland, France and the US as well as Hong Kong and Singapore, all the way to Australia’s doorstep. “He said ‘You know I can’t talk much, he said, because my phone might be bugged’”. The money involved is astonishing. And the escalating scandal is threatening to bring down Malaysia’s Prime Minister. Four Corners reporter Linton Besser investigates two sets of extraordinary allegations of bribery and corruption: one involving a massive arms deal; the other, the Malaysian sovereign wealth fund. It’s a story that’s made headlines around the world. Linton Besser’s pointed questions landed him and cameraman Louie Eroglu in serious trouble. 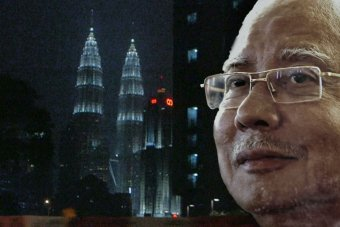 On Monday night Four Corners will reveal new allegations about the staggering sums of money that have flowed into the bank accounts of Najib Razak. And as the scandal grows, so does the crackdown on the Malaysian Government’s political opponents.